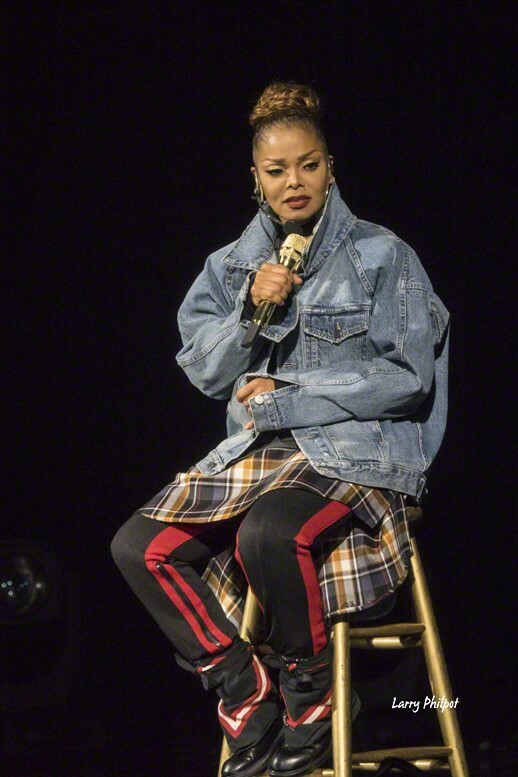 Fans crowded Bankers Life Fieldhouse Sunday evening to attend the long-anticipated #StateOfTheWorldTour put on by pop icon and OG Nasty Gal, Janet Jackson. The above descriptors do not apply to the show that was put on for fans from Ms. Jackson’s home state, however. The start of the show was promising. DJ Aktive, who is no stranger to getting the masses moving and ready for a party, layered on the energy with a solid mix of dance jams and heart thumping classics. The crowd was on its feet, dancing in anticipation for what was bound to be a show to remember. Shortly after DJ Aktive wrapped up his set the entire arena took on a much different vibe. True to the name of the tour, the main show started with a video highlighting the state of the world: hate crimes, white privilege, and domestic abuse to name a few. These themes were portrayed over and over throughout the show by means of hyper-sexualized dance choreography and videos. To be fair, regardless of the choreography that seemed to be recycled from song to song, the dancers were the saving grace of this performance. The dance ensemble was made up of many demographics and their talent really took center stage. Try as they might, the dancer’s energy didn’t deter from the fact that Ms. Jackson seemed to be lacking it. The stage, void of thrills but helped along by a mediocre light show, offered very little visual for the fans as Ms. Jackson would sit on stage to sing many of her pieces. Janet’s lack of energy directly affected the audience many of which were observed to be sitting for a good portion of the show. Ms. Jackson’s inability to connect with the audience had many leaving the show to refill their concessions. When she would get the crowd on their feet with songs like “Together Again”, “Nasty Boy” or “Rhythm Nation” she would leave the stage for a costume change and would struggle to regain command of the audience. Much of the set time was taken up with music videos from past albums which were an amazing throwback, however, the fans could have stayed home and watched them online. The costumes exhibited during the show were questionable choices for a pop icon who has directly influenced the fashion of young women across the United States. With the energy and theatrics low, wardrobe could have kept the crowds’ interest, yet the plain black bodysuits and layered, oversized clothes just weren’t doing it. Being aware that Janet has a new baby and a fresh divorce does lend sympathy and understanding. Despite the anemia of the performance smiles were still on the faces of the fans and it’s clear that it will take a lot more than just one lackluster show to kill Ms. Jackson’s Rhythm Nation.